While I no longer commute to an office, I still remember the days when one of the drawers in my desk was filled with key items to help me handle any issues that might arise during the work day. I didn’t want to schlep these items in my tote back and forth to work, so I stocked up a box in my work drawer to have a personal arsenal of supplies. My top items to have in a desk drawer at work are wet wipes, bobby pins, a stain-away pen, clear nail polish, tinted lip balm, floss, foldable ballet flats, fashion tape, lint roller, sanitary pads, safety pins, vitamin e oil, nail file, hand cream, hand sanitizer, and mints. Wet wipes are key to clean down pretty much anything: maybe coffee that spilled on your handbag or the hand cream that exploded inside your bag. It is great for wiping down your desk or a mark on your shoe. Foldable ballet flats are a perfect solution if you broke a heel, or just need an alternative to high heels. The stain-away pens are key when that tomato soup for lunch drips on your dress, and the lint-rollers are fabulous for pretty much anything that is stuck to you. Bobby pins are great when you need to fix your hair on the fly. Clear nail polish can used in a flash when going out for a last minute drinks with friends and you don’t have to worry about color matching your outfit, but gives your nails a polished look. It also is great for stopping pantyhose/nylon tears from getting worse; just dap some clear polish around the beginning and end of the tear to prevent it from getting bigger. Floss is a no-brainer when food gets stuck in your teeth and can act as a ponytail holder in a pinch when you realize you forgot your hairband for your after-work workout. Fashion tape is key for a ripped hem or if a button pops off your blouse, and mints are essential for pre-meeting prep. Sanitary pads are ready for action if your friend comes early, and a nail file is important for that sudden broken nail. Lastly, add Vitamin E oil for those hair fly aways, or to soften cuticles. Even use to rub your hands with it in lieu of hand cream or dap it for lip balm, or if a spot on your face is extra dry. Once hands are softened, use your hands to rub over stockings or a slip to lessen winter static cling. To round out your desk drawer, have tinted lip balm to soften lips and give a subtle pop of color if you forgot your lipstick at home. Also scented hand cream can soften hands and act as perfume in a pinch for a post-work date. Rub some on your wrists and on your neck. 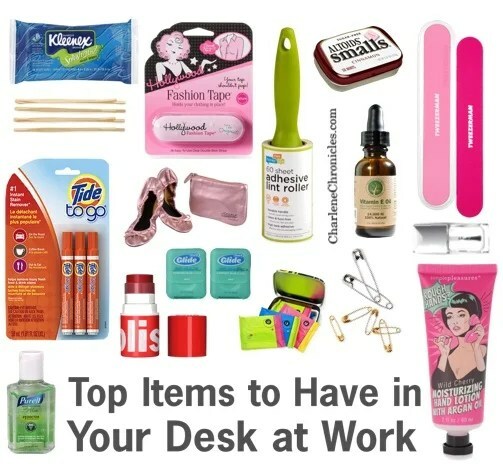 What are your must have items in your work desk drawer?